at least, after Hundreds of Years of research (aprox.) I found some Picture of the Backside from the Original Schaller GE Fuzz. made some PCB tracing with Target3001 (E-Cad like Eagle) try to get it in here. It`s just possible to make some pdf but no jpeg or something. milling cutter, i will try try it with a dremel cutting wheel. And be aware: there are some different layouts out of this time, i saw one with all legs of transistor 1 pulled through one big hole- for example. the 100K from Q2 Emitter to Q1 Base (the angular one) goes through the holes from the Transistors legs. Input is upper left corner on the Cap. On the schematic of the previous post, the connections of Emitter and Collector have been interchanged. The edit function did not work twice, Here's a supplement to the previous post. the values of the potentiometer values have been interchanged too. I´ve seen this schematic too but its completly wrong there is also just one other schemo getting around thats full of guesses. oh, and thanks for jpg , didn`t know how to manage this. I actually own this pedal. It's the heavy ' metal' enclosure with the AC192. 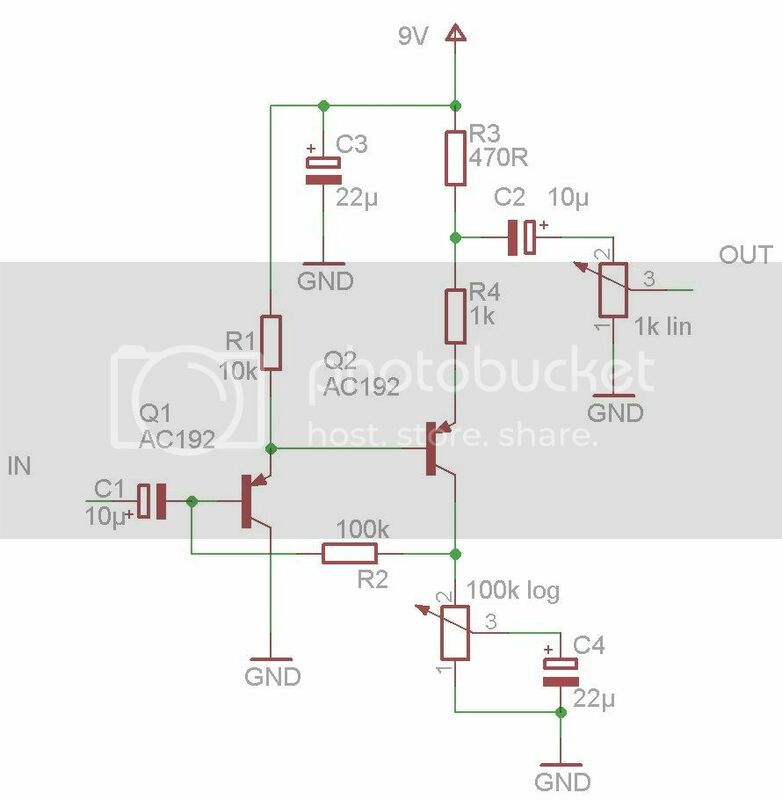 I looked at the schematic above and have looked at my pedal (which looks like its still original) for my values. These seem to vary a bit from yours. Maybe they did different versions..
note: The extra 25uF was soldered in afterwards.. although it's actually the same brand and time period. It seems legit and also done by the company itself. Therefore the 'PCB' design is the same for my pedal. i had alook from time to time in web and wondered for years, that there`s no Schematic/Tracing from this Fuzz before. [size=200][b][color=#800080]This is really a historic Moment!!!!!!! Thank you Guys for sharing this with me. By the way: I found this is one of the best sounding (Vintage)Fuzzes build, love the Sound and it´s much more versatile and useful than a Fuzzface. Thank you FUZZZzzzz for completing it and thanks Manfred for your help. I also did a little exercise. Can probably be smaller, but I like to build things easy. Yet unverified!